Doogee has built a name for itself the last few years thanks to super-cheap smartphones with thin bezels. But while previous designs have been rather uninspired, an upcoming model, the Mix 4, actually looks pretty sweet. 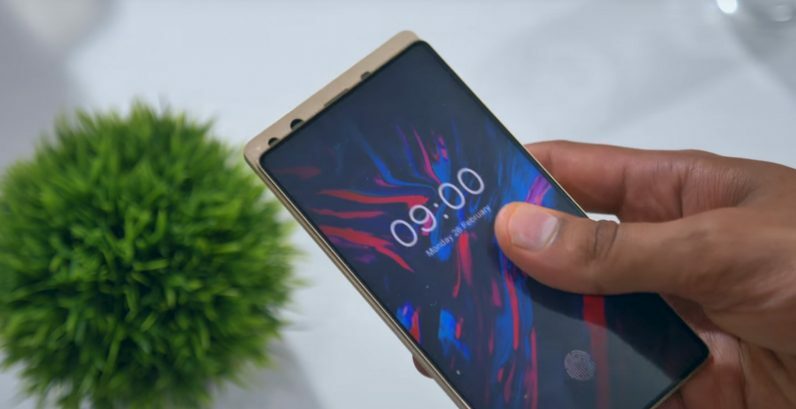 Instead of hiding cameras, sensors, and speakers in a thin bezel or notch, the Mix 4 hides them using a sliding mechanism. It’s the 90s all over again. A video by YouTuber Mrwhosetheboss shows off a dummy prototype with a 6-inch screen, provided to him by the company. And it truly is all-screen: because of the lack of a notch or bezel, the screen-to-body-ratio is a whopping 97 percent. For reference, the iPhone X has a screen-to-body ratio of approximate 83 percent, while the Galaxy S9 is 84.2 percent. The phone is divided into two segments of metal and glass. A thin front layer contains the screen, while all the other components are in the back. Sliding the screen down reveals a camera, speaker, and and ambient light sensor, which don’t have to be squished into a small space above the screen – hopefully leading to a better choice of components. The prototype also shows a fingerprint symbol on the dummy display, suggesting it has one of those newfangled under-the-screen sensors. As a consequence of the sliding design, the phone is thicker than many modern flagships, at 11mm. But I’ll take a little more junk in the trunk for a phone that’s more pocketable and easier to hold. Hopefully that extra space is taken up by a chunky battery, and the sliding mechanism should also help privacy nuts feel a bit safer too. It also introduces concern over moving parts, but I can see the sliding mechanism feeling super-satisfying too. All that being said, the phone will likely still be in the budget price range, considering the company’s previous phones, but Mrwhosetheboss says the company is planning to use a Snapdragon processor for the first time. That indicates it wantsto gain some traction in western markets, where Snapdragon processors are king. Chances are we’ll have to wait a while before it sees the light of day; previous Doogee Mix phones have been released towards the end of the year. Still, it’s nice to know that even budget manufacturers are exploring designs beyond the bezel.